garlic and ginger in a small food processor to a smooth purée. Finely dice the remaining 2 tomatoes and set aside. 3 minutes more. Stir in the tomato and ginger mix and simmer for 10 minutes, until thickened. Grate or chop the creamed coconut and add to the pan with the stock and coriander. Simmer for 6-8 minutes to thicken. 3. 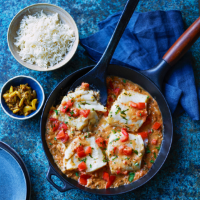 Carefully place the fish in the coconut curry and scatter over the diced tomato. Cover and simmer for 4-5 minutes, or until the fish is just cooked through. Garnish with finely chopped coriander and serve with steamed basmati rice, pickles and chutneys, if liked. This recipe was first published in Wed Oct 12 10:26:42 BST 2016.